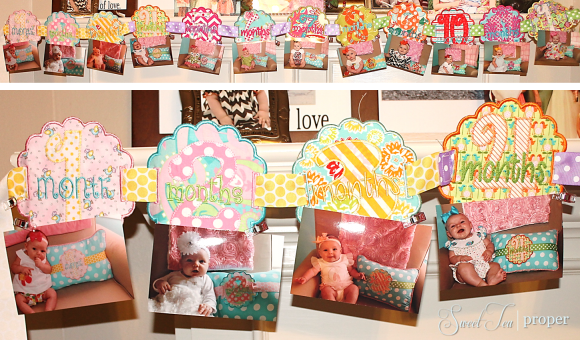 A couple of months ago, one of my dear friend’s celebrated her daughter’s 1st birthday party! As it turns out, in our close-knit group of friends, we only have little girls. It has become a “No Boys Allowed” zone. This isn’t by choice of course, but it is funny that it has worked out this way. One of the greatest benefits for myself as a soon-to-be mother to a little girl is being surrounded by the experiences, stories, and absolutely adorable ideas that these ladies have already brought to life. This birthday party is no exception. My friend Meggan transformed “Grandma’s house” into a lifelike Candyland as bright and inviting as she is. 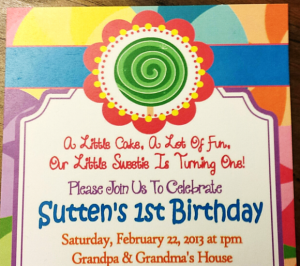 As another little one in our group turns 1 years old, let me invite you over for cake and of course candy as we scroll through the fun and colorful pictures from Sutten’s Candy Themed 1st Birthday Party! 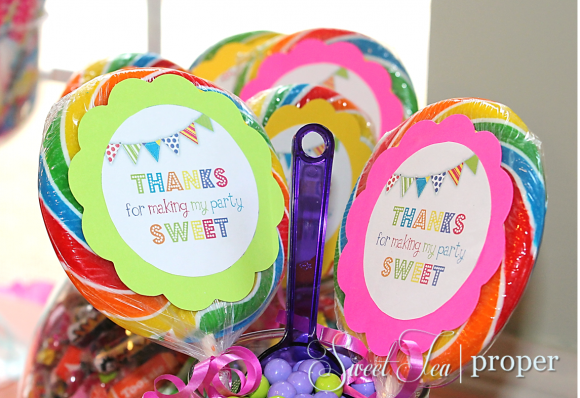 When it comes to a candy-themed party, there is an excess of available colors to choose from. Bright shades of blue, yellow, orange, purple, red, green, and pink filled this invitation preparing us for the fun to come. Upon arrival, “lollipop” signs lined the walkway up to the door where a bright tutu wreath greeted the guests. 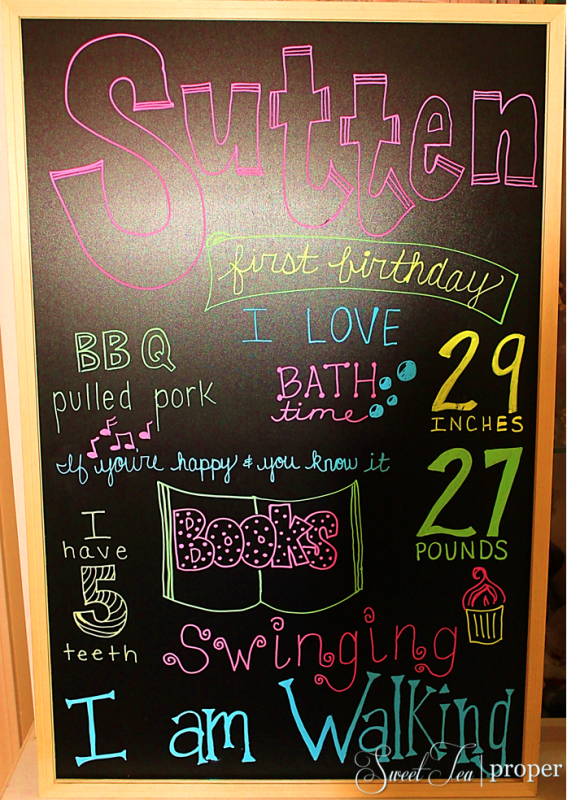 A lot can happen in a year… This chalkboard welcome sign allowed guests to view Sutten’s growth and favorite things. 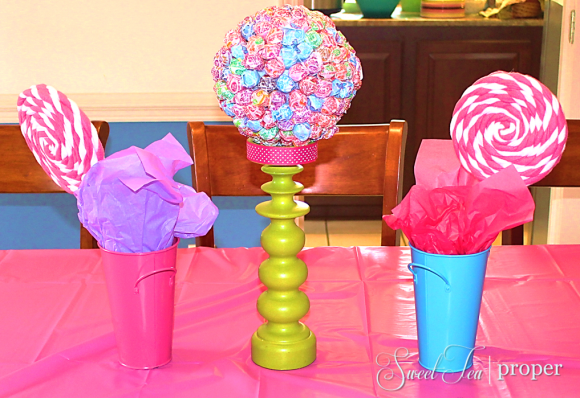 A round lollipop centerpiece made out of Dum-Dum candy served as the focal point for the dining table. Perhaps one of my favorite month-to-month picture ideas for the first year, Sutten’s grandmother sewed an amazing pillow for her with detachable numbers to capture her first year’s growth. Meggan used these photos to hang as a banner on the mantle of the fireplace. Every family needs a good seamstress and a grandmother seamstress is like striking gold! 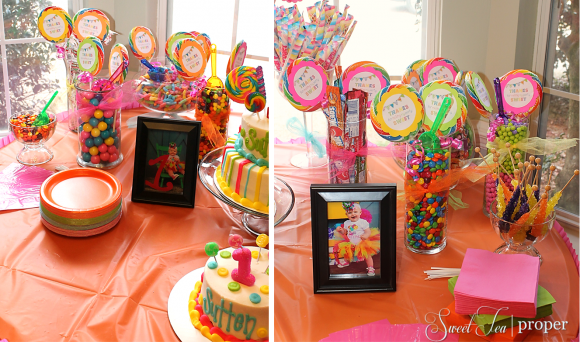 How could you throw a candy themed party without the ever-popular candy buffet? 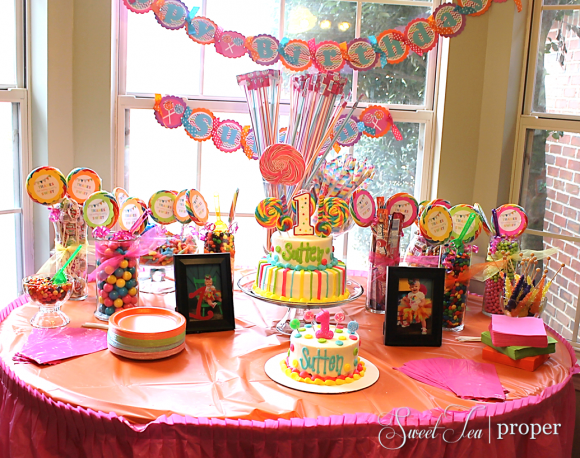 Filled with color and goodies, a brightly tiered cake, and a little cake for Sutten to dig into. Every candy princess needs a “throne”. With bright polka dot balloons and a tutu wrapped high chair, there’s just one thing left to do – let her eat cake! Thank you for being so sweet to drop by and celebrate with us. Don’t forget to take a treat to go! A special thank you to Meggan for sharing these fun-filled photos with us and a Big Happy 1st Birthday to Sutten! We can’t wait to watch you grow up into a little lady!